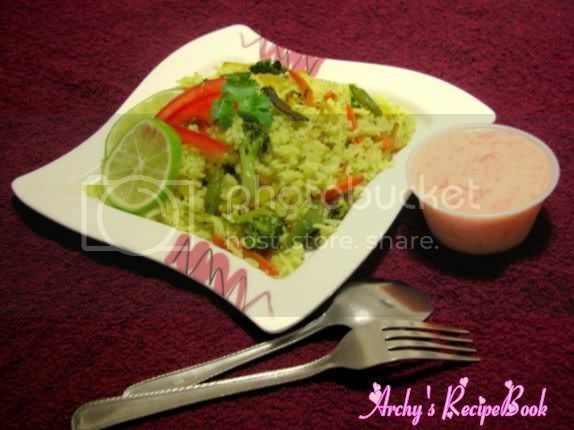 Simple and easy fried rice with any type of vegetables, or the left over vegetables or Rice. When bored of cooking rice-lentils-vegetables, I prefer to make and have this fried rice with raita. Spices can be changed on our preference. While cutting the vegetables just cut all the vegetables in the same shape, lenght wise or square. Can also try this in Indian style by adding red chilly powder/garam masala instead of pepper powder and seaanoning of our choice. 1. Heat oil in a pan, cinnanmon and onions. Saute till they are transparent. 2. Now add the mixed vegetable and pinch of salt fry them on medium flame 5-6 minutes. 3. When the vegetables are three fourth cooked add termeric, Italian seasoning, pepper powder, salt and stir. 4. Now add the cooked rice, mix it well. Garnish with sliced tomatoes,cilantro and squeeze some lemon juice on top of the fired rice while serving. 5. Fried rice ready to go with any raita. nice healthy combination..looks delicious too..
Wow colorful and yum recipe. That looks lovely! Nice presentation! Tempting! Beautiful presentation!And who does not like fried rice? Nice presentation! I have to try carrot raita!! looks good. 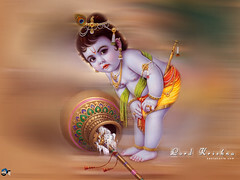 Deesha, Usha, Preety, Sukanya, Kichen flavours, Anusriram, Srilekha, Smitha, Sharmi.. Thank you all for ur sweet words.. just improving my photo skills :) !! 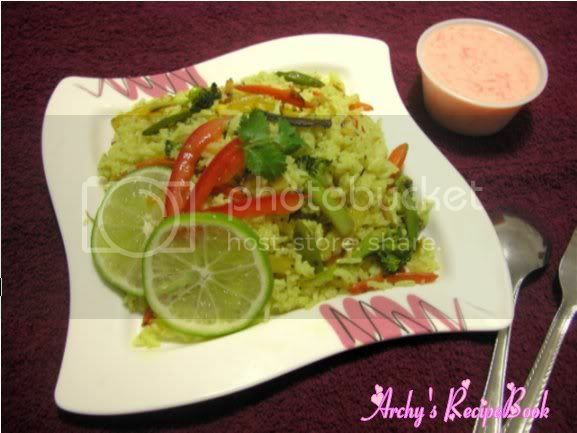 Hey Archana, Superb presentation and recipe. Posted a card for you in my blog. Kindly check it out..! Thanks an thanx a lot for the wonderful card !! fried rice looks so mouth-watering. Happy holidays. This is my first time here. U have a lovely space.Yummy fried rice! Do have a look at mine too! me too make this often, whenever bored with regular food, with watever available. Its a nice change.